original paste diluted with water." "The vases and sacrificial vessels, called p'ing, lei, tsun, and yi, are comprised in this general name of cho ch'i. 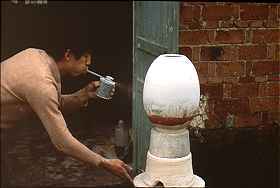 The plain round vases are fashioned upon the potter's wheel, in the same manner as the ordinary round ware; they are then dried in the open air and turned on the polishing wheel to be finished with the knife. After the vase has been thus shaped it is washed with a large goat's-hair brush dipped in water, till the surface is perfectly bright and spotlessly clean. After this the glaze is blown on, it is fired in the kiln, and comes out a piece of white porcelain. If painted in cobalt on the paste and then covered with glaze, it is apiece decorated in blue. In making the carved polygonal, ribbed, and fluted vases, the paste, wrapped in cotton cloth, is pressed with flat boards into thin slabs, which are cut with a knife into sections. The pieces are joined together by some of the original paste diluted with water. There is another kind of vase which is made by the process of molding, and which is finished after it is taken from the mold in the same way. 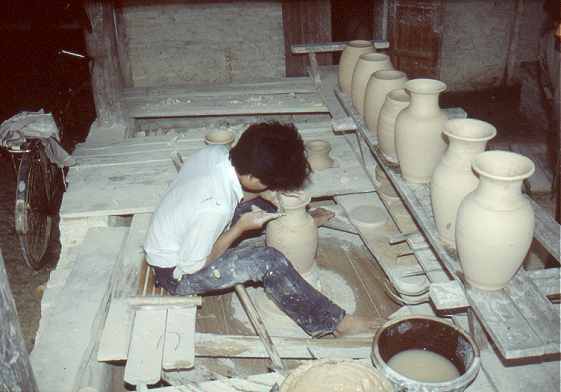 The carved polygonal vases and the carved molded vases have to be filled in and washed clean with the brush in the same way as the round vases turned upon the wheel. All the varied forms of vases may be engraved with the style, or embossed in relief, or carved in openwork designs, for which purposes, when sufficiently dried, they are given to artificers specially devoted to these several branches of work." This text was written on Imperial command in 1743 by Tang Ying, the celebrated superintendent of the porcelain manufacture in the province of Jiangxi. It is widely reprinted and the most authentic version is to be found in the official annals of the province of Jianxi, Book XCIII, folio 19-23. The first draft seems to have been written in 1735 and the version above was added to a set of twenty illustrations of the manufacture of porcelain in 1743. The actual illustrations have never been identified. Original translation from Chinese by S.W. Bushell, 1899. The text is illustrated with photos taken on location by Jan-Erik Nilsson in 1991 and 1992.